The Trump administration is prohibited from issuing permits for seismic testing in the ocean during the government shutdown, a federal court ruled Tuesday. Energy exploration companies conduct seismic testing to try to discover potential spots that contain oil or natural gas below the ocean floor. Science has shown that seismic testing, which produces extremely loud, persistent blasts of sound beneath the sea, can harm and even kill marine life, from whales down the food chain to plankton. Five exploration companies have asked for permits to begin the testing. The Hill reported the story yesterday afternoon. In addition to environmental groups, Gov. 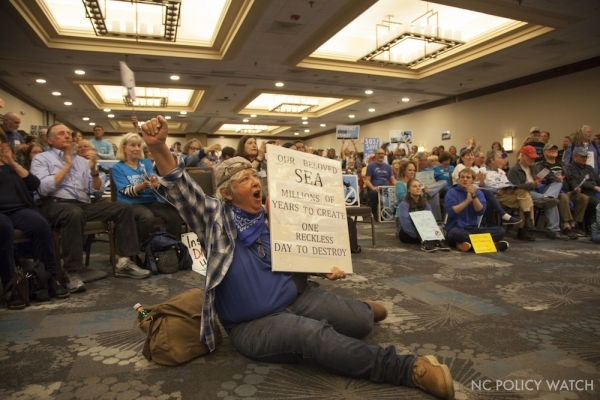 Roy Cooper’s administration has opposed energy exploration and seismic testing off the North Carolina coast, citing potential environmental damage and economic threats to tourism because of accidents or spills. Likewise, nearly every coastal government in North Carolina has publicly stated its opposition. Justice Department attorneys representing the Interior Department’s Bureau of Ocean Energy Management (BOEM) had asked [Judge] Gergel to pause the case during the shutdown because they could not write filings. Gergel granted that pause, but said that the same logic means BOEM should be prohibited from granting any permits until the government reopens. Federal attorneys had told the judge previously that the BOEM would not issue testing permits during the shutdown. But the agency later updated its shutdown plan to bring in employees to work on the permits, and attorneys told the court that the permits might be issued as early as March 1.